What are the renal arteries? What are the causes of renal artery stenosis? How common is renal artery stenosis? What problems does renal artery stenosis cause? Who should be screened for renal artery stenosis? What are the common imaging tests to evaluate renal artery stenosis? What functional tests are used for the diagnosis of renal artery stenosis? What are medical treatments for renal artery stenosis? What surgical procedures are available for renal artery stenosis? Which patients can benefit from surgical procedures for renal artery stenosis? Elevated blood pressure (hypertension) is common and is generally simply treated with medications. Likewise, various other methods are used to treat the large majority of patients with kidney failure. There is a small subgroup of patients with high blood pressure and/or renal failure caused by renal artery stenosis. Some of these patients may respond favorably to dilating the narrowed artery, using the technique of angioplasty. The patients that can benefit from angioplasty have a severe stenosis (75 % or greater narrowing) of the renal artery and do not have a very high renal vascular resistance. Renal refers to anything related to the kidneys. Renal arteries carry blood from the heart to the kidneys. They branch directly from the aorta (the main artery coming off the heart) on either side and extend to each kidney. These arteries take a very large volume of blood to the kidneys to be filtered. The heart pumps out approximately 5 liters of blood per minute, and about 1-1.5 liters (25%) of the total volume of blood pumped by the heart passes through the kidneys every minute. Renal artery stenosis (narrowing) is a decrease in the diameter of the renal arteries. The resulting restriction of blood flow to the kidneys may lead to impaired kidney function (renal failure) and high blood pressure (hypertension), referred to as renovascular hypertension, or RVHT ("reno" for kidney and "vascular" for blood vessel). Renovascular hypertension is as likely to occur with bilateral stenosis (when arteries to both kidneys are narrowed) as with unilateral stenosis (when the artery to one kidney is narrowed). The decreased blood flow to the kidneys impairs renal function. Renal artery stenosis may cause renal failure in some patients. There is no predictable relationship between renal failure and renal artery stenosis. Some patients have very severe bilateral stenosis and normal renal function. Most cases of renal failure are related to diabetes, hypertension, glomerular sclerosis, contrast nephropathy, drug toxicity and other causes. 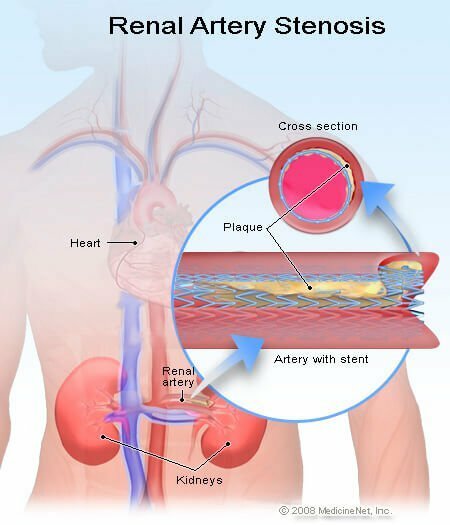 The majority of renal artery stenosis is caused by atherosclerosis (hardening and narrowing of blood vessel wall from the inside) similar to the process that occurs in blood vessels in the heart and other parts of the body. Less common causes of renal artery stenosis are rare conditions such as fibromuscular dysplasia of the vessels (narrowing of the vessel due to internal thickening of the blood vessel wall), arteritis (inflammation of the blood vessel), or dissection (tearing and division of the blood vessel wall). Narrowing of the kidney arteries is more common in individuals 50 years of age and older. It is estimated that some degree of narrowing (greater than 50%) is found in about 18% of adults between 65-75 years of age and 42% of those older than 75 years of age. This may be due to the fact that atherosclerosis is more common in this age group. In younger patients, the narrowing of the renal artery usually is due to the thickening of the artery (fibromuscular dysplasia) and it is more common in women than men. It is estimated that renal artery stenosis accounts for approximately 1% of mild to moderate cases of high blood pressure. It may be responsible for more than 10% of cases of severely elevated or difficult to treat high blood pressure (hypertension). an incidental finding (discovered through routine tests or tests performed for another condition) of one small kidney compared to a normal sized one on the other side. Typically, unilateral (one-sided) renal artery stenosis may be related to high blood pressure whereas bilateral (two-sided) renal artery stenosis is more often related to diminished kidney function. When the circulating blood volume becomes depleted as a result of, for example, dehydration or bleeding, the blood flow to the kidneys is likewise reduced. The normal physiologic reaction to a decrease in blood flow to the kidneys is a complex hormonal response by the kidneys, called the renin-angiotensin-aldosterone system. This hormonal system is activated as a defense against low blood pressure and low circulating blood volume. The kidney senses a possible decrease in the circulating blood when blood flow through these vessels is reduced. As a result, there are increased blood levels of the hormone angiotensin 2, which causes narrowing of the small blood vessels in the kidneys. This, together with increased blood aldosterone levels (another hormone), promotes salt retention by the kidneys, and works to maintain blood pressure and restore blood volume. Accordingly, this hormonal system is protective in response to reduced circulation of blood to the kidneys that is caused either by volume depletion, as described, or by reduced blood pressure. This otherwise normal hormonal response can become abnormal (pathologic) when the decreased blood flow to the kidneys results from a narrowing of diseased renal arteries. In this situation, the kidneys receive less blood flow, which then signals a sense of depletion of the circulating blood volume, despite the fact that the blood volume is actually normal. So, the diminished renal blood flow, by stimulating the production of angiotensin 2 and aldosterone, can lead to an abnormal increase of blood pressure (renovascular hypertension). Moderately to severely elevated blood pressure, with an onset before age 30 or after age 50. Moderately to severely elevated blood pressure in a person with known atherosclerosis elsewhere in the body (history of heart attack or stroke). Easily controlled high blood pressure that becomes difficult to control. Worsening of kidney function after initiation of certain blood pressure medications [angiotensin converting enzyme inhibitor (ACE Inhibitor), or angiotensin receptor blocker (ARB)]. Several tests exist to detect any evidence of renal artery stenosis. They can be divided into imaging tests and functional tests. The imaging tests provide a picture of the blood vessel and its anatomy and reveal the degree of narrowing. The functional tests provide information about whether the narrowing is significant enough to cause the high blood pressure or kidney dysfunction. Each of these tests has advantages and shortcomings. An angiogram of the renal arteries is the best test available to detect the degree of narrowing. However, angiography is not the primary test and is performed only for those patients who have evidence of stenosis on less invasive testing, such as ultrasound, CT Angio, or MR Angio. Angiography is a preliminary portion of a procedure, which will generally culminate in angioplasty and possibly stenting to treat a stenosis identified on less invasive testing. The angiogram of the renal arteries is similar to an angiogram of the heart and involves insertion of a catheter through the groin into the main artery (the aorta), that is advanced to the level of the renal arteries. These tests are most commonly performed through the groin, but arteries in other parts of the body, such as the arms, can be used equally well. A dye is injected, and x-ray images are taken to see the caliber of the blood vessel and extent of the narrowing. An angiogram is considered an invasive test (insertion of the catheter inside the body) and therefore is not widely used because of the risk of complications. This test also may not determine if narrowing is truly significant to cause the problem or not, and so it may be necessary to combine this with a functional test. Generally, a narrowing of greater than 75% by angiogram is considered significant enough to cause high blood pressure or kidney dysfunction. An additional advantage of an angiogram is that if a treatable narrowing is seen, it may be fixed at the same time via angioplasty or by placing a stent (described in more detail below). Magnetic resonance angiography (MRA) is similar to a magnetic resonance imaging (MRI). Contrast dye is injected into the blood via a vein in the arm, and pictures of the specific area of the body (in this case the renal arteries) are taken and analyzed. The accuracy (specificity and sensitivity) of this test is reasonable. This test cannot be done in patients with metal implants, pacemakers, or claustrophobia (fear of closed spaces). It may be used in people with mild to moderate, but not severe, kidney problems. Computed tomographic angiography is similar to a computed tomography (CT scan) and has reasonable accuracy. This is also done by injecting a contrast dye into the blood and taking pictures of the renal arteries. This is not recommended in people with moderate to severe kidney problems as it may make the problem worse. Doppler ultrasound is the least invasive imaging test for renal artery stenosis. It is performed similarly to a regular ultrasound by placing a probe on the abdomen to visualize the flow across the renal arteries and also to measure any narrowing. Its accuracy is similar to the other tests above, but its advantage is that it can measure the size of the narrowing as well as the flow across it. The disadvantage of this test is that it is time-consuming and may take up to a couple of hours to complete. It is also very operator-dependent, meaning that the accuracy of the result is dependent upon the expertise and experience of the ultrasound technician. The main functional tests for renal artery stenosis include the plasma renin activity test and captopril renogram. These tests have been largely replaced by the imaging tests described above because they are less accurate, but they may be still performed to help establish the diagnosis of renal artery stenosis. The plasma renin activity measures the activity of the hormone renin (described above). Activity of renin is generally higher in the kidney with renal artery stenosis compared to the other kidney. This response may be exaggerated by administration of captopril (Capoten), an ACE inhibitor medication used to treat high blood pressure. The renogram measures the activity of the kidneys after injection of a radioactive material that is taken up by the kidney. By administering captopril prior to the test, the activity may become more enhanced on the normal kidney compared to the one with renal artery stenosis. This may indicate a significant renal artery narrowing on the side with less activity. In bilateral (both-sided) and unilateral (one-sided) renal artery stenosis associated with high blood pressure, controlling the blood pressure with usual blood pressure medications is the first and the safest treatment. ACE inhibitors or ARB medications with or without a diuretic (water pill) may be tried first. This approach may lead in some patients to worsening of their kidney function. Therefore, kidney function needs to be followed closely and if worsening of kidney function is evident, these medications may need to be stopped. It is worth noting that if renal artery stenosis is found incidentally when performing a test for another disease and there is no evidence of kidney dysfunction or high blood pressure, then no treatment may be necessary. Sometimes even significant stenosis may not be associated with high blood pressure or kidney dysfunction. In these situations, periodic monitoring of blood pressure and kidney function may be advised. If the results of any of these screening tests suggest an abnormality of the renal artery, an x-ray angiography is then performed. A 75% or greater narrowing of the renal artery seen on the angiogram has been termed treatable renal artery stenosis. Treatable means that the stenosis of the artery is severe (75% or greater narrowing), the artery needs to be widened (dilated), and it has a good chance of responding favorably to the dilatation. Usually right at the time of the angiography, an angioplasty is done. In this procedure a tiny balloon is inflated in the interior space in the artery (the lumen) to dilate the narrowed artery. Additionally, as part of the angioplasty procedure, a stent (tubular device to prevent recurrence of the narrowing) may be placed in the artery. In rare cases, vascular surgery (on the blood vessels) may be done for renal artery stenosis. In these situations, typically another vascular surgery near the renal arteries, for example the aorta, is the main procedure. If renal artery stenosis is also present, then a bypass renal artery surgery may be done at the same time. These invasive procedures are typically reserved for cases that do not respond to medical treatment and where it has been determined that the stenosis is causing or contributing to the uncontrolled high blood pressure. These invasive procedures may only be done if it is thought that the kidney dysfunction or elevated blood pressure can be effectively treated with the procedures. In patients with renal failure due to bilateral renal artery stenosis (narrowing on both kidneys), angioplasty procedures for both renal arteries may improve or stabilize kidney function. Similarly, in hypertensive patients with unilateral (one-sided) renal artery stenosis, angioplasty procedures of the involved renal artery may cure or improve the high blood pressure. Patients with milder degrees of stenosis (less than a 75% reduction in the width of the renal artery lumen) usually do not benefit from angioplasty. These patients need to be followed by sequential imaging procedures to detect further narrowing (progression) to the point of treatable stenosis. At that point, angioplasty procedures can be done with the hope of a favorable response. Some studies have suggested that patients with a very high degree of renal vascular resistance (which reflects permanent damage to the kidneys), even with a 75% or more stenosis of the renal artery, often have a poor response to the angioplasty procedures. (The tension of the blood vessels to the kidney, called renal vascular resistance, is measured by Doppler ultrasonography. A so-called resistive index over 0.8 is considered very high). In these patients, angioplasty is usually not done and the high blood pressure or renal failure is managed only by the customary therapeutic measures for these problems as described previously. eMedicine, "Renal Artery Stenosis/Renovascular Hypertension." Previous contributing author and editor: Dwight Makoff, M.D. and Leslie J. Schoenfield, M.D., Ph.D.